Brexit and employment law: a bonfire of red tape? If you’ve been following the Brexit debate in the media, you no doubt will have noticed how European employment laws are frequently bandied around as the sort of laws that Britain could do without, thank you very much. As welcome as a giant cheesecake at the Weight Watchers Annual Convention, the European Working Time Directive is never far away from the lips of Brexiters, and is routinely cited as the one of the worst kinds of “red tape” laws coming out of Brussels. But have you ever stopped to think about the assumption that underpins such statements? That is the notion that all employment laws, including those that are designed to protect workers from excessive working hours, are in fact a barrier to economic growth. Cast as drivers of inefficient intrusions into management time, such employment protection measures are deemed to be unnecessary pieces of social regulation, which must be stripped back. By doing so, employers would be rendered free to co-ordinate their labour force as they see fit, thus retaining flexibility in their internal labour markets, and increasing employment rates and overall economic growth. In this blog, I aim to probe the received notion that employment laws are inefficient. A slew of justifications for this claim will be examined, before moving on to focus on the counterclaims made by economists who argue instead that employment laws promote economic efficiency. Ultimately, as lawyers, and not economists, this is not an issue for us to resolve, but a flavour of the economic arguments in favour of and against the introduction and preservation of employment laws in a countries’ legal order is a useful thing to understand. Whenever proposals for reform of employment law are suggested by government, it is particularly eyebrow-raising how frequently some of the claims and counterclaims we are about to examine are in fact versed as part of the relevant debate. As welcome as a giant cheesecake at the Weight Watchers Annual Convention, the European Working Time Directive is never far away from the lips of Brexiters, and is routinely cited as the one of the worst kinds of “red tape” laws coming out of Brussels. Turning first to the claim that employment laws are inefficient, it is contended that countries with policies encouraging flexible labour markets and less rigid employment laws will have companies that generate higher stock market returns: since the likelihood of being fired is greater in the absence of job security protections such as unfair dismissal laws, employees will invest greater effort to succeed. They will do so in order to minimise the scope for them to be discharged, and as such, will achieve greater satisfaction in their jobs. This increased satisfaction rate translates into higher firm productivity and stock market prices. For the same reason, there is evidence to suggest that one consequence of increased employment protection legislation is a reduction in worker effort in their jobs, together with higher staff absences in comparison with workers with more limited employment protection laws, such as casual workers, temporary workers, and other atypical workers. In essence, countries who choose to introduce rigid employment laws are acting as surrogate regulators of the terms and conditions of the contracts of employment of employees and employers in their jurisdiction. By over-riding the independent judgments of workers and employers in favour of the collective and social interests of certain sections of society, efficiency is reduced. Although equity in the workplace might be increased via redistributive employment laws – although this point is not conceded by adherents of this view – efficiency is clearly impeded. This view is countered by those who support employment laws. The principal rejoinder is that such laws act as positive factors contributing to an increase in the productive output of workers. The suggestion being made here is that an alignment between equity and efficiency is not impossible. For example, those in favour of employment laws will point towards the evidence that suggests protective employment laws do not have any negative effects on equality, productivity or unemployment, and that they may have a positive impact on innovation and productivity. The positive impacts suggested here may be attributable to the “efficiency wage” theory. This is the idea that better-paid and happier employees enjoying higher contractual benefits and treated well and appreciated by their employers in the workplace equates to higher productivity and firm value. Whatever the outcome of the Brexit debate may be, one thing is for sure, and that is that the status of European employment laws will not be far off the agenda. By emphasizing the market-enhancing effects of European employment laws, the Remain campaign will try to highlight the positive effects of economic integration. On the other hand, the Out campaign will point to the adverse economic consequences of European legislation in the field of social and labour market policy that is “imposed” by the EU on the UK. Ultimately, the decision whether to stay or go will be left to the voters, but what does seem to be clear is that the claim regarding the role of employment laws in stifling economic growth is inconclusive, with as much published research providing evidence for the view that such laws may have positive implications for aggregate market rates of productivity, employment, and innovation. Featured image credit: Paper tape table dispenser, by Lilly M. CC BY-SA 3.0 via Wikimedia Commons. 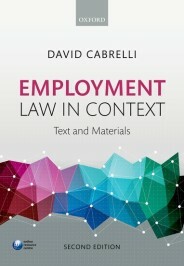 David Cabrelli is a senior lecturer in commercial law at the University of Edinburgh. He has written extensively on the subject of employment law, and is the author of Employment Law in Context (OUP 2016). His research has been cited with approval by the UK Supreme Court, the Supreme Court of Australia and the Hong Kong High Court. You can follow David on twitter at @CabrelliDavid.